One of the more hotly contested subjects between the sabermetric crowd and the “traditionalists” is the importance of wins as it pertains to starting pitchers. Highlighting the issue this year is one Jacob deGrom of the New York Mets, who is in the midst of one of the best pitching seasons in baseball history. As of this writing, deGrom has a National League-leading 1.77 ERA, the lowest by any Met since Dwight Gooden in 1985. He has a league-leading 2.03 FIP and is second in the NL in innings pitched. In addition, deGrom not only leads the NL in pitching fWAR; he is the league leader in fWAR. All these measurements point to someone who should lead the list of NL Cy Young candidates. But some, like Michael Wilbon of ESPN, have argued that deGrom should not even be in consideration for the Cy Young award, because of his .500 record. No starter in major league history with a .500 record or worse has ever finished higher than fourth in Cy Young voting. The one starter to finish fourth? Orel Hershiser, who did so in 1987 and 1989, years which sandwiched his Cy Young Award-winning ‘88 season. But pitchers with sub .500 or worse record have led the league in WAR before. The Met last to do it? Jon Matlack in 1974. That year, Matlack finished the season with a 13-15 record, the same record as Stan Bahnsen of the Chicago White Sox. But to compare the two on any stat beyond wins and losses doesn’t do either service. Bahnsen’s ERA was 4.70 whereas Matlack finished with a 2.41 ERA, third in the National League. His seven shutouts also led the league, and Matlack finished in the top 10 in innings pitched, WHIP, strikeouts, and strikeout to walk ratio. Matlack was not among the 11 pitchers to receive NL Cy Young votes that season. Wilbon’s approach would very much be in line with what the general expectations were for a Cy Young pitcher back in 1974. The main culprit of Matlack’s poor record, as one would expect, was not an inability to pitch in “clutch” situations, but rather the near complete lack of run support the Mets provided for him. In his first start of the season, Matlack surrendered just one run to Mike Schmidt and the Phillies in seven-plus innings of work en route to 9-2 Mets victory. That would be the only game of the season in which the Mets would give Matlack more than six runs of support. On the year, Matlack received an average of 3.15 runs of support per game. Compared to the other NL Cy Young finishers, he received at least a full run less of run support per game than virtually every other pitcher. One name that should jump out from the list of Cy Young vote-getters is Jack Billingham. With a 19-11 record for a 98-win team, voters thought highly of Billingham’s contribution to the Reds, but his 89 ERA+ is the worst of any pitcher ever to receive a Cy Young vote. Like Matlack, deGrom has suffered immensely from poor run support, with only Aaron Nola of the Phillies able to lay claim to a similarly dire gripe. But unlike Matlack, it’s doubtful deGrom will have to deal with any Jack Billingham-type starters. During the 1970s, there were only four pitchers—Dave Roberts in ‘71, Fred Norman in ’76, Tom Seaver in ’76 and Don Robinson in ’78—who won less than 15 games and received any Cy Young votes. Even during the 1980s (not counting the strike-shortened ’81 season) only eight starters managed to receive a Cy Young vote while winning fewer than 15 games. Winning 20 games did not guarantee you Cy Young consideration, but you likely had to be a 20-game winner (or at least close to it) to garner serious attention. This sort of threshold may help explain why someone like Bert Blyleven was never taken more seriously in Cy Young voting. Even though Blyleven finished in the top 10 in ERA 10 times, and was in the top 10 in innings pitched 11 times, Blyleven only had two seasons in which he won more than 17 games and only three seasons where his winning percentage topped 66 percent. Blyleven placed in Cy Young voting just four times during his career and wouldn’t be elected to the Hall of Fame until his 14th ballot. This for a pitcher who had more WAR than any other pitcher from 1970-1989. What has changed about Cy Young voting over the years has been the increased importance of a pitcher’s ERA, even as that statistic’s primacy has given way to more sophisticated means of pitcher evaluation with many voters. 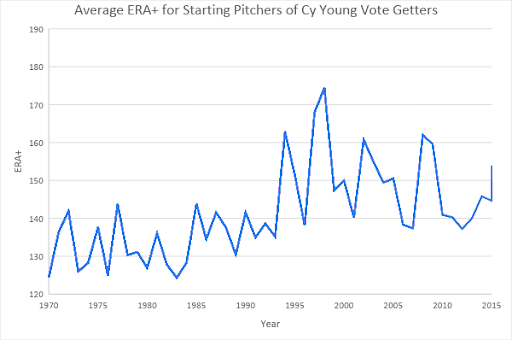 Looking at the graph below, we can see how the ERA+ of Cy Young vote-getters has trended upward over the years. Although the shift upward has been subtle, it is telling of how voters’ standards have changed over the years. Since 2010, been two starters have posted an ERA+ of 140 or better and not received a Cy Young vote: Jaime García in 2010 and Matt Harvey in 2015. Compare that to the 1970s, when 15 starters finished the year with an ERA+ of 140 or better. Of those 15 starters, one name appears twice: Bert Blyleven. But one starter appears on the list three times. That starter? Jon Matlack. 1974 wasn’t even the first year Matlack failed to receive much-deserved Cy Young consideration. In his rookie year of 1972, Matlack finished 15-10 with a 2.32 ERA in 244 innings pitched. All of that would be good enough to help Matlack win the Rookie of the Year award, but as in 1974, Matlack failed to place in the Cy Young voting. And as in 1974, Matlack endured incredibly poor run support. Of the eight starters who received a Cy Young vote that year, only teammate Tom Seaver had worse run support. A somewhat unusual bit of Seaver’s elevation over Matlack is that Matlack had a considerably lower ERA and pitched only 18 fewer innings than Seaver that year. It’s possible Seaver’s name value helped elevate him over Matlack, but it’s hard to see any motivation for voting for Seaver above Matlack that season beyond their respective win-loss records. In 1978, Matlack, now with Texas, would once again fail to garner even a single Cy Young vote despite posting an ERA of 2.27 in 270 innings pitched, both career bests. As in ’74, Matlack finished in the top 10 in numerous pitching categories including WHIP, strikeout to walk ratio, and walks issued per nine innings. But like 1974 and 1972 Matlack would once again be the victim of an inept offense, which led to a paltry 15-13 record. Matlack’s three runs per game of support was more than a run per game less than any other Cy Young candidate aside from Jim Palmer, and nearly two runs less than half the pitchers who received Cy Young votes. As in 1972, Matlack finished behind a better-known teammate, future Hall of Famer Fergie Jenkins, who had a better win-loss record than Matlack, but little else in his favor. The only season in which Malack would garner any Cy Young consideration would come in 1976, during which, perhaps unsurprisingly, Matlack would post the best win-loss record of his career, going 17-10 with a 2.95 ERA, good enough for a sixth-place finish in voting. But that year Matlack received 4.66 runs per game of offensive support, which helped to bolster his win-loss record. His ERA+ that year was a pedestrian 111, and his 2.95 ERA was slightly worse than the 2.94 team ERA posted by the Mets. So what does this mean? For Jacob deGrom, probably not much. In spite of how Wilbon and some fans feel, deGrom is in no danger of going voteless. Indeed, he is considered by many to be the Cy Young front-runner. How close he gets to winning the award with a .500 record remains to be seen, but since 1971, no pitcher has ever finished lower than third in Cy Young voting in a season in which he had an ERA below 2.00, and at least 200 innings pitched. This is the range I would expect deGrom to finish if he did not win the award. This isn’t uncharted territory in modern baseball. deGrom’s season is similar to Félix Hernández’s 2010 Cy Young campaign. Even though Hernández finished with a rather pedestrian 13-12 record, his 2.27 ERA led the American League, as did his 249.2 innings pitched; his 3.04 FIP was fourth. 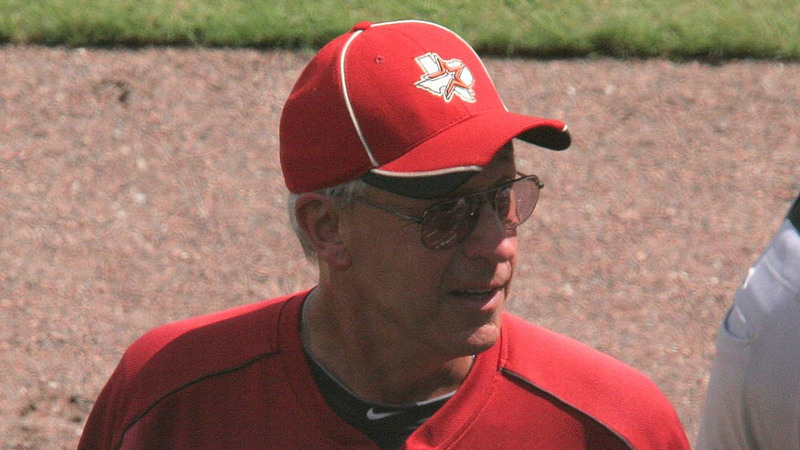 For Jon Matlack, the win-centric viewpoint determined a career that was far more under the radar than it should have been. For Bert Blyleven, it meant having to wait years after he should have to find his rightful place in Cooperstown. For Rick Reuschel, it has meant any serious Hall of Fame consideration went out the window on his first ballot. Like Blyleven and Matlack, Reuschel suffered from a lack of run support for most of his career, leading him to finish with a career mark of 214-191. Though modern Sabermetric standards indicate he is a player voters should perhaps give a second chance, he is at least a pitcher who should have received Cy Young voters in more than three seasons. How seasons like deGrom’s and Hernández’s translate to future Hall of Fame voting remains to be seen. The argument between deGrom and Nola, or deGrom and Scherzer, or Scherzer and Nola comes down almost as much to statistical preference as it does on-field ability. But luckily for deGrom, the voters have demonstrated that they’ve come a long way from Jon Matlack, and his largely forgotten seasons. Should deGrom win, we may look back on 2018 as the year that, when it comes to Cy Young voting, the primacy of the win met its final end. Yes, the Mets bullpen was pretty lousy this year, but I don’t know how many games he left with a lead and the bullpen proceeded to blow it for him. I am guessing this probably happened more to him than others, since if he did have the lead when he exited, it was probably a very slim one due to the poor run support. It wouldn’t take much for the lousy bullpen to blow the lead and either he ends up with a no decision, or if they let the inherited runners score, he gets the loss. Oops,. I see that GoNYGoNYGoGo partly answered my question already above. The graph of ERA+ of winners is a cool simple idea for this. What’s interesting is that the change looks to have happened a generation ago — from 1980 to 2000 or so. Before any of this Moneyball stuff. Bill James power! Michael Wilbon is a complete moron.